"This is the best place to go and get a basket of wings. They have from very mild to hot enough to burn your tounge off. I personally like the mild ones I am not big on hot things and they are good." -CitySearch Review from Katherine M.
"This is one of the best fried food restaurants ever! I love the green tomatoes and the prices are really low for the quality of food. I would recommend this restaurant to anyone. They do call-in orders and have a pick up window, so it is very convenient on lunch or when the kids are in the car! Love it!" 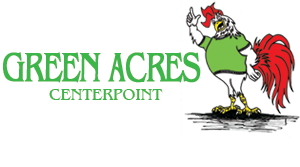 "Green Acres not only has delicious home cooked southern fare, like macaroni and cheese, fried okra and green tomatoes, etc. But, they are also generous in the community. They donated fabulous food for the girls to eat for the Miss Center Point Pageant, and the girls ate every bite and wanted more!! :-D thanks Green Acres!!" -Yelp Review from Dawn S.